A compelling and perfectly priced debut for Symplesound, then, and we look forward to hearing what it comes up with next. Fantastic sounding libraries. Good value. This series of five Instrument Rack libraries for Ableton Live sees soundware newcomer Symplesound sampling the hell out of the Roland SH-101, Moog Little Phatty, Doepfer Dark Energy Mk 1, DSI Prophet 08 and Oberheim SEM synths. Each library is subdivided into separate Bass, Pad, Lead and Pluck instruments, every one sampled in minor thirds over five octaves. A top-level Instrument Rack contains the multisampled synth itself in a Simpler-based Rack with eight common Macros (Cutoff, Resonance, Attack, Filter Env, etc), and an Effect Rack with bespoke Macros for each instrument type (Stereoize, Phaser, Chorus Ensemble, etc, for the Pad Rack, for example). Standard and Lite versions are included - the former 32-voice polyphonic and employing Live 9.5's new analogue filter modelling, the Lite versions being 8-voice polyphonic and using the older filters (swapping the Drive Macro for Filter Morph) - and they all come as projects rather than Live Packs, so they're just 'browsed and used' rather than 'installed'. In a nice touch, however, full documentation is provided via Live's built-in Help system. 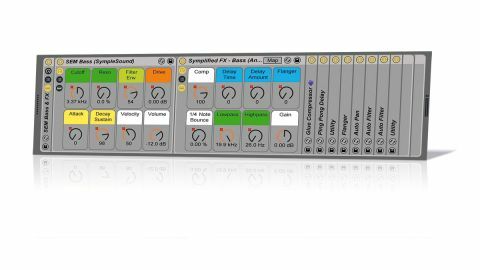 In lieu of Live's standard preset management system, Symplesound has supplied presets as MIDI clips, setting the Instrument and Effect Rack Macros via clip envelopes and demoing each sound with an appropriate note sequence. It's a novel setup, although once you're done with the five clips that come with each instrument, you may well find yourself saving them out as Rack presets (a one-click operation) and reverting to the 'old way'. Most importantly, all five libraries sound fantastic and play beautifully, particularly if you're lucky enough to be controlling them with Ableton Push, alongside which they truly come alive, thanks to the thoughtfully assigned Macros. Symplesound has done an amazing job of capturing the analogue 'souls' of the synths. On the down side, The Analog Collection is quite limited in terms of scope, due to the limited control set; and being so few in number, the clips are handy for getting to know the instruments, but we wouldn't call them a major selling point. Indeed, the jury's out as to whether or not we'd prefer conventional Rack presets.